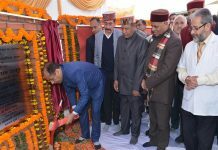 Shimla: : Chief Minister Virbhadra Singh announced coaching facility for aspirants of civil services of OBC community at Shimla through Himachal Pradesh University along with hostel facility. He said that learned teaching faculty would train and help such aspirants to take civil services examinations. 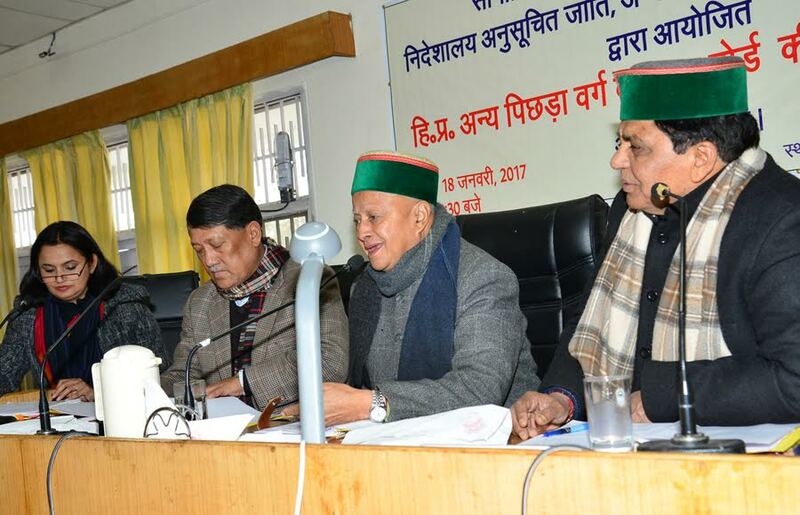 The Chief Minister was addressing a state level meeting of the OBC Welfare Board organized today here at Prayas Bhawan, Dharamshala. Virbhadra said that as his government was committed for welfare and development of all sections of Other Backward Castes (OBC) various welfare policies, programmes and schemes were being implemented. He said that to ensure that no community was left out from the development process, various welfare boards were constituted. Recently, the announcement to constitute Dhiman Kalyan Board was a step in this direction. He directed the concerned departments to formulate policies and programmes on the basis of the discussion held in such meetings. He said that suggestions and feedback coming out as a result of such meeting was momentous in preparing new policies and planning programmes. Every community had its own problems and difficulties. Such discussions helped in making the government aware of their needs and demands enabling it to take effective steps for their welfare. Nominated members helped in raising the voice of affected persons of their communities in welfare meetings. Chief Minister told that welfare of OBC community was on the priority of the state govt. and was taking every possible step for its upliftment. He expressed hope for the OBC community to develop and progress in every walk of life. He wished that useful discussion would be held in the meeting so that concrete steps might be taken for its welfare. The chief minister directed the concerned departments to take appropriate actions and address the grievances in the stipulated period. Earlier, Social Justice and Empowerment Minister Dr. Dhani Ram Shandil while welcoming the chief minister and the members of the OBC community coming for the meeting across the state said that a number of welfare policies and programmes were being executed in the state for the upliftment of this community including others. He said that grants were being extended to the homeless families for construction of houses. He said that a finance and development corporation was formed for making the people of the community dependent through self employment activities. A lot of scholarship schemes were being run to help the students of such community to make them self reliant. Dr. Shandil told that in the current financial year, a target was set to provide training to 1031 candidates of this community through skill development in computer and other programmes and help them in getting different certificate and diploma courses. Chief Secretary VC Pharaka presented vote of thanks. Secretary, Department of Social Justice and Empowerment Anuradha Thakur conducted the meeting. Issues like construction of roads from Ghandal Chhatera to Tool and GSSS, Shakrah, link road to Bhutua village, funds under CSR from power projects to build Darini Shahpur road, non functional machines of health institutes at various places, incomplete building of health department, filling up of various posts, electricity, transport, bus services, creation of wards in gram panchayats, IRDP, soil conservation, protection of agriculture land, repair and construction of pucca paths, inquiry of diversion of allocated funds and to take action if found guilty, raising of reservation quota from existing 18 to 27 per cent, raising the validity period of OBC certificate, installing of solar lights in OBC habitation, construction of community centres for OBC etc. were taken up in the meeting. IPH Minister Vidya Stokes, CPS Neeraj Bharati and Jagjivan Pal, ACS Tarun Shridhar, Dr. Shri Kant Baldi and R.D. Dhiman and former M.L.A. Surendra Kaku were among the prominent persons present on the occasion.